Build a Better Mousetrap. Ideally, entrepreneurs start their small business on the side and keep a day job until the revenue is high enough. Brandon Medenwald actually pulled this off. Brandon and his partner Bill Burgess are software developers living in Fargo, North Dakota. Two years ago, Brandon found himself frustrated that existing digital technology didn’t solve the problem of knowing who was in the office at any given time. Over a drink, Brandon told Bill he could build a better “mousetrap” in a weekend and Bill challenged him to do just that. Two weeks later, Brandon and Bill locked themselves in the basement and by Sunday they had programmed an app called Simple In/Out. A month later they launched it. Total launch costs–$300 to cover the domain name purchase and iOS and Android App application fees to be sold in app stores. Their idea was simple. Use the GPS technology found on cellphones to identify whether someone was on site or not. For certain types of organizations such as first responders (Fire, EMS, Police) knowing who is nearby when additional people are needed is essential. The same can be true for sales and customer service representatives. By using the built-in GPS technology, Simple In/Out immediately identifies who is on site. Worried that an employer might find someone shopping at the mall instead of in the office (!! ), no problem. To protect people’s privacy, the app never transmits the user’s precise location unless they choose to activate this feature. Rather, it transmits their status (in or out). The user’s GPS coordinates are not sent nor seen by the app, the server or anyone else. 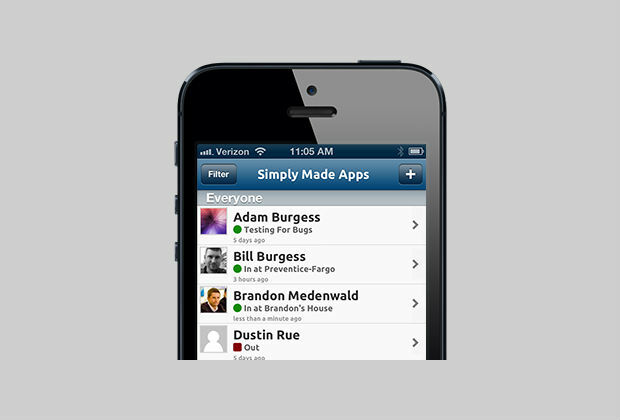 While most of Simply Made Apps 3,000 plus customers are utilizing the free version, revenue from the subscription version of the app (packages range from $9-$79/month) was sufficient to set Brandon free from fulltime work for someone else. Just two years after launch—in February 2013—Brandon was finally in a position to quit his day job. After some discussion, however, he chose to stay on with his employer as a 20-hour/week contractor. With the launch of their next app (shh it’s a secret! ), they anticipate that Bill will move over to being full time at their company. *The owners can code. They don’t need a technical founder or web development company—an issue that plagues many a startup. It is arguably a lot easier to outsource marketing, social media and many operational needs of the business than the development of a technology. *They were patient. By launching the free version first, Brandon and Bill gained insights and market experience that proved valuable for introducing the paid version. *They supported the app with a dedicated website. This gave them more credibility and another way in which to market the app. *Ecommerce was controlled by them, not Apple. While Apple makes it easy to handle everything including purchases, Brandon and Bill knew they planned to offer an Android version, so they never ceded control of payments for the iOS version. Brandon argues that the key reason things have worked out is that they didn’t set out to be rich. They only wanted to solve a “pain point” and were willing to swap out a little bit of free time to commercialize their passion. Now, they are in a position to continue working on products they love creating. Even if the money proves to be a bit less than what they made in their prior careers, the tradeoff is worth it to Bill and Brandon. Look no further than your own experiences for the seeds of the next great opportunity. Satisfaction and money may just follow. These guys almost lost their business in the housing crash, but be willing to pivot saved them. Learn more about these SEO pros and SERPs. Share your tips for starting a small business in the comments below! ⇐ Should Professors Be Tapping Their Networks For College Students?